Another personal-ish post for today!The movie theater that my friends and I always go to has "Bargain Tuesdays" where movies are only $6 for the entire day. I know some other places have ridiculously cheap movie tickets but in New York City that can be quite rare even in the other boroughs. Even though I have Netflix, I prefer watching action movies in the theater for the full effect. The Pirates of the Caribbean series is one that I've followed since the beginning and thoroughly enjoyed. To be honest, I was hesitant to watch On Stranger Tides because Orlando Bloom and Kiera Knightly do not make appearances. Johnny Depp got a few laughs and chuckles out of me and the mermaid scene was very well done. On a side note, the girls who played the mermaids were gorgeous! Unfortunately I was disappointed that this fourth movie made hardly any references to the previous movies. The lack of continuity was my biggest gripe and of course, the ending is open ended. It's safe to say we can expect a fifth Pirates of the Caribbean film sometime in the future but I'm not exactly looking forward to it. 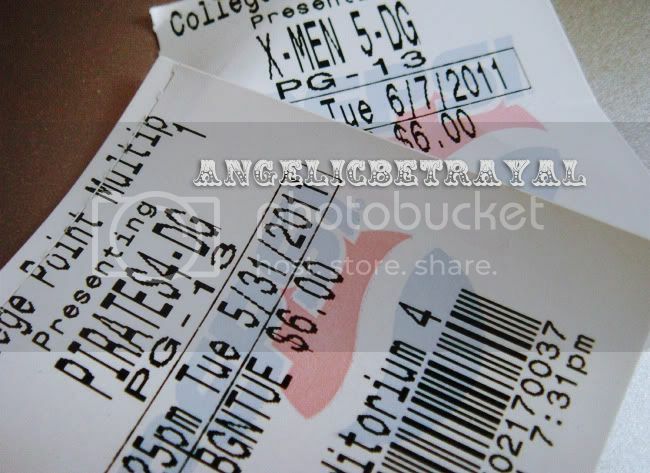 Out of all the super hero, comic-based movies, my favorite is probably the X-Men series. The variety of characters and powers always keep me interested and the storyline is complex yet understandable. First Class did not disappoint and I found myself going "ohh" and "ahh" throughout the film. According to my friends who are more attune to the original X-men storyline, the movie shouldn't have existed at all though. Nonetheless I enjoyed the casting (especially James Mcavoy!) and the acting was well done. I'm confident there will be more X-men related movies and I'll definitely be catching those at a theater! I live in NYC too. Which movie theater do you go to? I was bummed about the Pirates movie with no Orlando Bloom or Keira Knightley. It says on the movie ticket :) It's the College Point theater but I think the area is actually called Whitestone. It's near Flushing in Queens.